I suppose there are endless ways to process a dramatic event, many things you can do to help navigate the path through the inevitable mess that follows. This is the story of my path. After the bushfire in February, I was feeling severely disenchanted with the Australian bush. I was becoming blind to the beauty, instead seeing it all as same old-same old - dry, dangerous and devastatingly hard to live within. That pessimistic perspective started to shift when the eucalytpus regrowth began in May, three months after the fire. Suddenly our “dead” forest was alive again, and it was incredibly clear that there was nothing “same-old” about our patch of Australia. 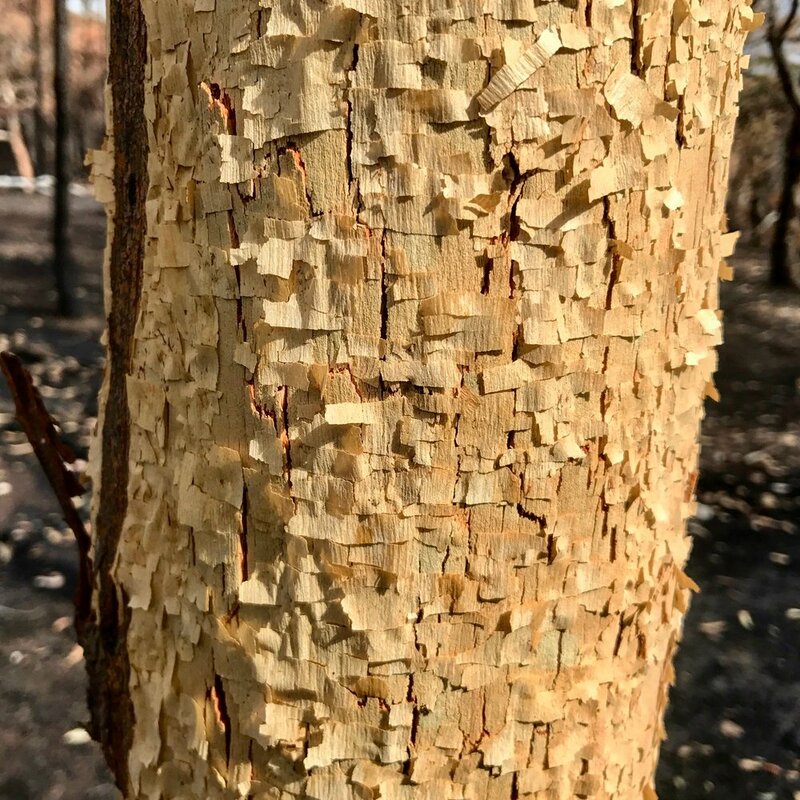 The way the bark burned and shed and recovered, the variety of new leaves popping out of blackened trunks, the incredible fungi that thrived in the ashes… all of it made us acutely aware of just how biodiverse and special our 20 acres are. And so began a mission to, initially, identify every variety of eucalypt growing on our property. Sounds easy, but there are almost 900 varieties of gum tree in Australia, and a fair number of them are endemic to our part of the country. This was further complicated by the fact that all we had to go on were burn patterns on the trunks (different types of bark burn differently) and the new leaf growth that pops out all over the trees after a fire (called epicormic growth). I put a call out for advice and resources and, along with a huge number of reference materials, one friend suggested I go to an art exhibition at the Australian National Botanic Gardens by Sally Blake, who was exploring the dye potential of eucalyptus trees. WOW! What a wonderful worm hole that led me down! Anyhoo, to cut the rest of a 6-month story short, in this process we did indeed identify all of our gum trees, but I also became completely enamoured with the process of extracting botanical dyes and using them to dye wool. What resulted is two-fold: a unique dye-ary of our property, and such a strongly rekindled love of the bush that surrounds us that it defies explanation. I’ve been posting this process on instagram and quite a number of people have been in touch asking about creating and using eucalyptus dyes. Whilst all of this information is available online from people much more experienced than me, I figured that it wouldn’t hurt to add my much-simplified process here. 1. Extract the dye by boiling leaves in water (the quantity of water is the amount you need to cover the leaves and keep it boiling for an hour - no different to cooking pasta, but for longer), and then let it cool completely. 2. Put the wool into the cooled dye pot, add more water if needed, and bring it to a simmer. Turn the heat off and let the wool cool completely in the pot. 3. Rinse the wool out and hang it to dry. To avoid felting the wool (particularly a risk with non-superwash wool), always start and finish with all liquids at room temperature, and give the wool plenty of space in the dye pot. That’s it! There really is nothing more to it. I made a little video to show just how easy this process is, in case you are keen to give it a go. The end result was a blanket made entirely of locally produced, superfine and totally luxurious merino wool (grown on a property just 20kms from us - at Millpost Merino), dyed only with eucalyptus trees growing on our property. And, more over, a rekindled love for my patch of this glorious planet.